I’ll admit that, when I first heard about The Emotion Thesaurus, I reacted against the whole concept. It’s a reference book full of ‘beats’ of action (he bit his lip! he ripped at his hair! 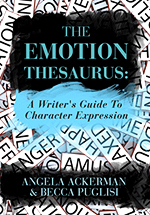 ), which you can insert into your fiction to show the reader how a character is feeling, rather than telling them. But… but… (I spluttered, rending my garments to show I was aggravated…) your beats should come organically! You should know your characters so well that their actions come to you automatically! You should strive for originality in your writing, not all this lip-biting/hair-ripping! In the few weeks since I purchased this book, it’s become close to invaluable to me. I do wish some of the suggested beats were less clichéd. You can find yourself in the situation of swapping out a tacky adverb and replacing it with a tacky cliché, which is hardly a step up. Nonetheless, in a pinch, it’s great (she said, biting her lip).